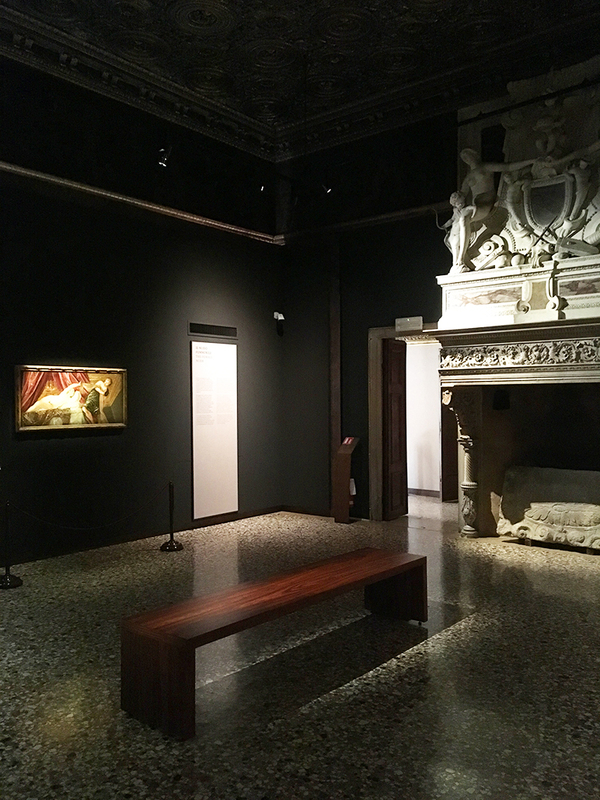 Curators Robert Echols and Frederick Ilchman, under the consultative direction of Gabriella Belli, have brought together fifty paintings and twenty drawings by Tintoretto. They take us through his development as an artist to his position of one of the Venetian greats. Giovan Battista Comin or Robusti? As well as his date of birth, the artist’s name is also a movable feast. His father, a native of Brescia in Lombardy, was called Giovan Battista Comin. In 1509 during the War of the League of Cambrai, he and his brother Antonio fought on the Venetian side during the siege of Padua. They distinguished themselves by their robust defence of one of the city’s gates and so were nicknamed the ‘robusti’ brothers. The brothers received Venetian citizenship in thanks for their service and moved to the city where Giovan Battista took up the trade of silk dying under the name of Robusti. The young Jacopo, or Jacomo as he appears to have called himself—in Italy the names are considered the same—was nicknamed, Tintoretto, ‘the little dyer’ or ‘the dyer’s son’, on account of his father’s work. He never practised the trade. This nickname existed in the form Tintorello and also Tentor. The modern accepted form of Jacopo Tintoretto is that used by Vasari in his Lives of the Artists. The exhibition begins and ends with two self portraits of the artist. The former, dated around 1546, is usually kept in the Philadelphia Museum of Art, whereas the other, from around 1588, is in the Louvre. The Philadelphia portrait shows a young man, staring out of the canvas with all the fire and arrogance he is reputed to have had. The older man, recognizable by the same moustache now white and part of a shaggy beard, fixes us with a strikingly similar stare. It was this arrogance, or rather conviction in his own abilities, that enabled the dyer’s son from the poor parish of San Cassiano to become one of the most celebrated artists in Venice. He is said to have been apprenticed to Titian, the greatest artist of his generation, but after only ten days, having seen some sketches by the young Jacopo, the great man ordered him out of his house forever. Judging by the way that Titian treated the adult Tintoretto, we can surmise that the motive for this was jealousy of the boy’s abilities. Whatever the motive, it left the boy without a teacher. Tintoretto seems to have learnt his trade by copying the great masters. These include Titian and other Venetians, but also the contemporaries from Florence and Rome, most importantly Michelangelo. Tintoretto is reputed to have introduced mannerism to Venice through his study of him. Inspired by a quotation that whoever could draw like Michelangelo and use colour like Titian would be ‘the god of art’, Tintoretto decided to learn from those artists in order to claim the title for himself. The exhibition has a collection of sketches in which the young Tintoretto practises drawing classical and renaissance sculptures (we should remember that Michelangelo was more of a sculptor than a painter). There are also paintings completely in Michelangelo’s style. Michelangelo was in Venice in 1530 and so it’s possible that the nineteen-year-old Tintoretto could have met him. He certainly seems to have seen at least copies of his works. Most striking to me is the picture of Sant’Agostino risana gli scianciati, c. 1549, on loan from the Musei Civici in Vicenza. This could be pure Michelangelo. If fact, a figure in the bottom left-hand corner of the work reminds me of one of the figures in Michelangelo’s Last Judgement in Rome’s Sistine Chapel. The pose is almost identical. Michelangelo to the left, Tintoretto to the right. In the 1540s, Jacopo received his first big breaks. He was commissioned to paint some ceiling panels by the poet Pietro Aretino, a great friend of Titian. Titian was not in Venice at the time, but when he returned and found Jacopo had insinuated himself into Aretino’s circle, he went crazy. This outburst affected the relationship between Titian and Aretino for a while but led to Aretino’s coldness towards the younger man as the two old friends made up. It was commissions by the Scuola Grande di San Marco and then the church of the Madonna dell’Orto, into which parish the up and coming artist moved in around 1548, that launched Tintoretto’s career. However, he still had to fight to get work. Vasari tells us that the Scuola Grande di San Rocco, which is now filled to the brim with Tintoretto’s work, asked him to submit designs for a ceiling, along with Salviati, Zucchero, and Paolo Veronese. Instead of a design, Tintoretto, noted for his fast work, produced an entire painting of San Rocco, which he had placed in the ceiling where the final commission was to go. When they saw it, the heads of the Scuola Grande where furious, pointing out that they had asked for a design, not the final work and that they wouldn’t pay for it. He then gave it to them as a gift which they were obliged by their own rules to accept. It remains there to this day. The exhibition focuses further on Tintoretto’s techniques, including his use of wax models, and his lightning abilities which led to the vast number of canvases which populate the churches of Venice today. He didn’t work alone but had assistants, among whom were his son Domenico but also his daughter Marietta. La Tintoretta, as she was known, became an accomplished artist in her own right, although only one remaining painting can be attributed to her today. The exhibition includes, in a section dedicated to Tintoretto’s portraits, Ritratto di una donna in rosso, on loan from the Kunsthistorisches Museum in Vienna, which some have attributed to the hand of Marietta. Portrait of a woman in red, Kunsthistorisches Museum, Vienna. Finally, we come to the paintings that Tintoretto made for the Doge’s Palace. Following a disastrous fire in 1577, Tintoretto was no famous enough to be commissioned, along with Paolo Veronese and others, to decorate the damaged rooms (Titian had died in 1576). At this point in the exhibition, we find the four allegorical paintings, including his masterpiece Venus Bacchus and Ariadne, usually in the Sala dell’Anticollegio, placed where we can admire them close up. The strength of this exhibition is to contextualize Tintoretto’s work and to give us greater insight into his technique and range. We see some early paintings which we are not familiar with, them having been taken from Venice, which help us to appreciate how the artist arrived at the point in which he could execute the more familiar pieces in San Rocco, the Madonna dell’Orto, and the Doge’s Palace. On the whole it’s a delight for those passionate about Tintoretto as well as a great introduction for those unfamiliar with this most Venetian of artists. Highly recommended. Tintoretto 1519–1594 is at the Palazzo Ducale, Venice until 6 January 2019. Have you seen the Tintoretto exhibition? Which was your favourite work? Which is your favourite work by Tintoretto in general? If you like Tintoretto, why not try my dessert named after him to celebrate his anniversary? Luca, a great article! I look forward to visit the exhibition at the end of the month. Thanks Katia! I’ve always loved Tintoretto and it was had to know what to leave out. You will love the exhibition. I will probably go again before January as there is such a lot to take in. I don’t have the chance to go very often in Venice, but I was there earlier this year and am sorry to be missing this exposition. My favorite venetian walks are taken in early morning or in the evening along the fondamente in Cannaregio, and I never miss walking in front of his home, or just stand on the bridge over rio della Sensa. Maybe this is some kind of fascination with the artist, but this time I rented an apartment at the corner of Calle Arigoni and fondamente della Sensa, to be near his house and in my favorite area. The short walk between the Orto vaporetto stop to the fondamenta, on ramo and calle Piave, sometimes made me feel I was in old times in a small city, not in the touristic turmoil the city can be. My favorite painting is The Presentation of the Virgin.